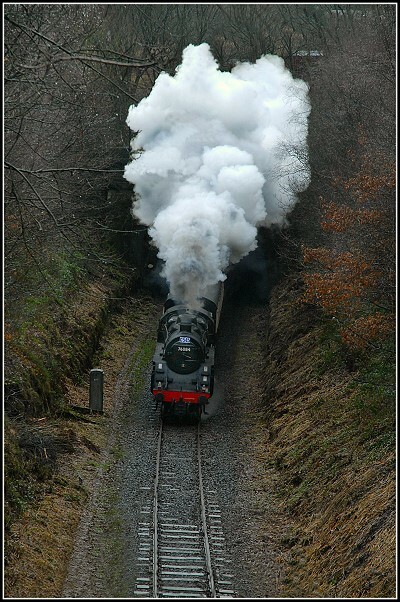 Stephen Dutch Photography: Full steam ahead! I decided to go and recce a new walk today so I parked at Ramsbottom Railway Station. I was told there was a steam rally on so I thought I may see a few trains as quite a few of the paths I was using were next to the railway line. After passing through Nuttall Park I saw this cracking view of the railway tunnel and decided to wait a bit. I was using a friend's camera that he kindly lent me so I thought this would be a good test and the first day I had been out with it properly. I could hear the train coming, I heard the whistle in the distance, I waited about ten minutes and then it emerged from the tunnel. I was able to rattle off about six photos before I disappeared in a cloud of steam and the train was gone! Taken on a Nikon D200.